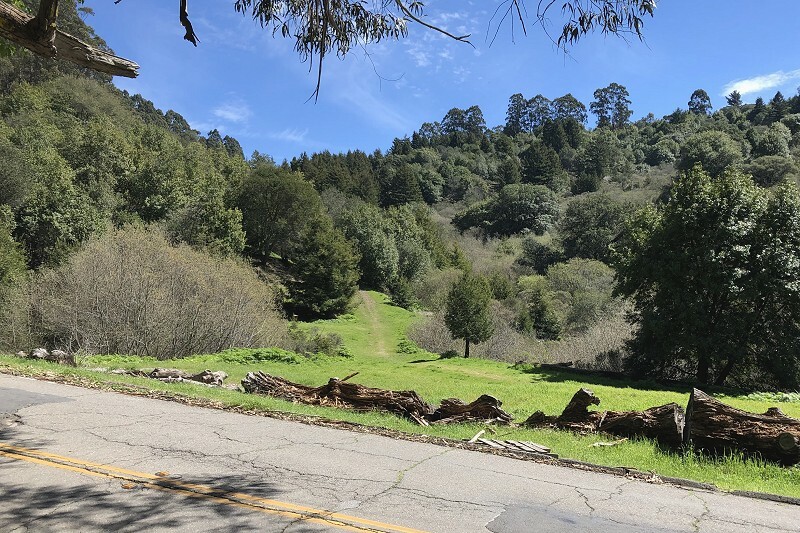 I’ve spent an inordinate amount of time lately in the obscure part of the Oakland Hills between Piedmont Pines and Canyon. 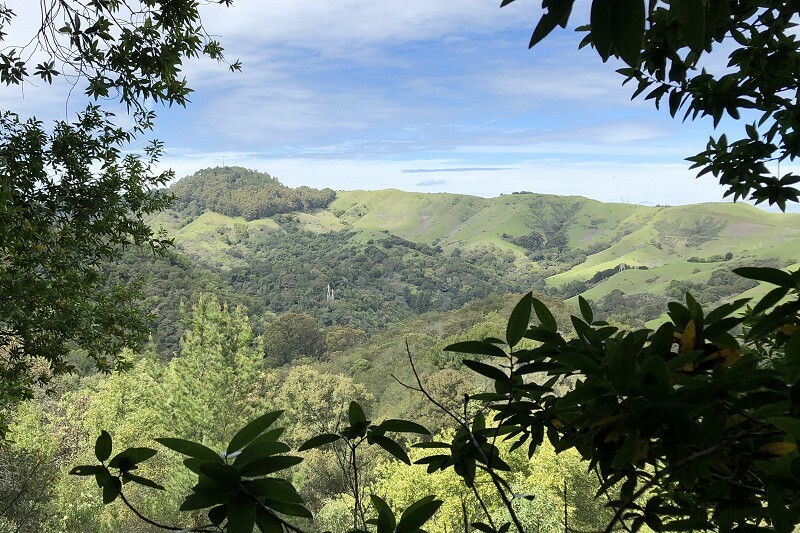 Much of it leaves me puzzled, and some of it leaves me dazzled, but I did manage to slow down and get a decent look at the rock along the East Ridge Trail in Redwood Regional Park. You’ve walked on it if that trail is your favorite hike, starting from the Skyline Staging Area. 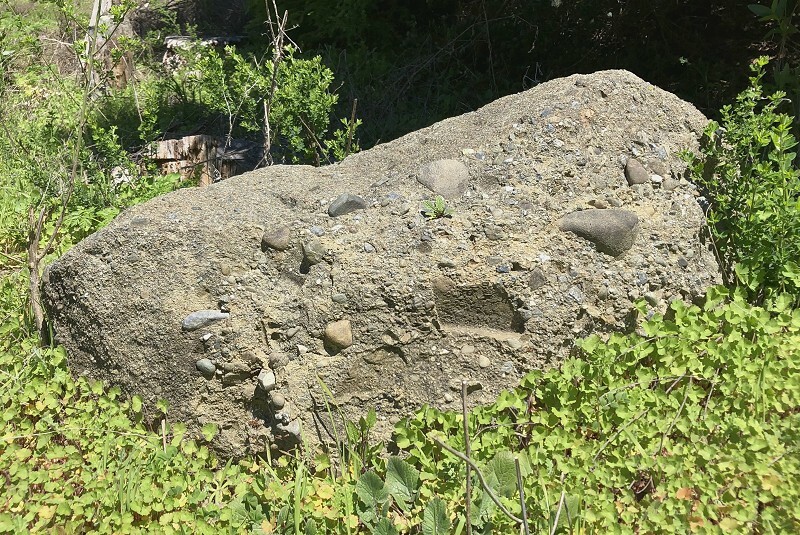 The first mile of the trail exposes this rock in the roadbed. 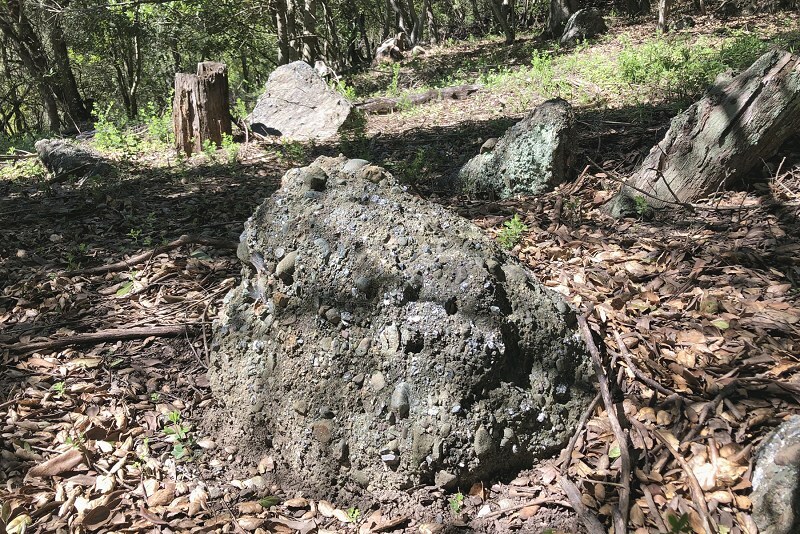 Stay on the trail, because actual outcrops are hard to find, and soon the poison oak will seal the woods off for the year. It presents colors of greenish-brown, buff, tan, dun and gray but the overall impression is a light brown. What do we know about it? 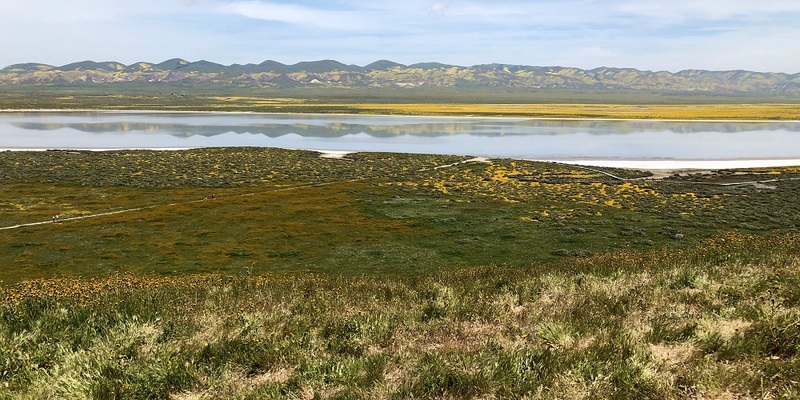 James Case gave it a searching look for his 1963 PhD at UC Berkeley and assigned it an age, based on fossil shells and foraminifers — one-celled “animals” with carbonate skeletons — in the early to middle Eocene, somewhere around 50 to 40 million years old, maybe a bit older. 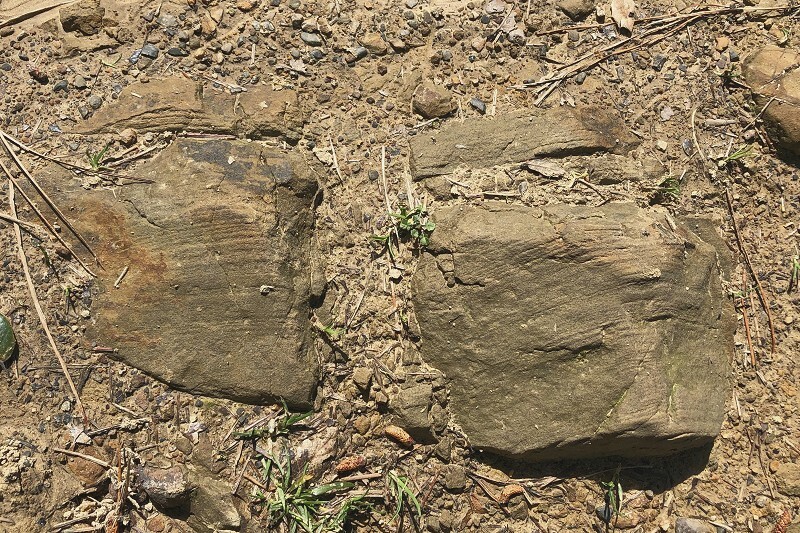 The specimens came from “thin beds of fossiliferous limestone” that Case noted on East Ridge. 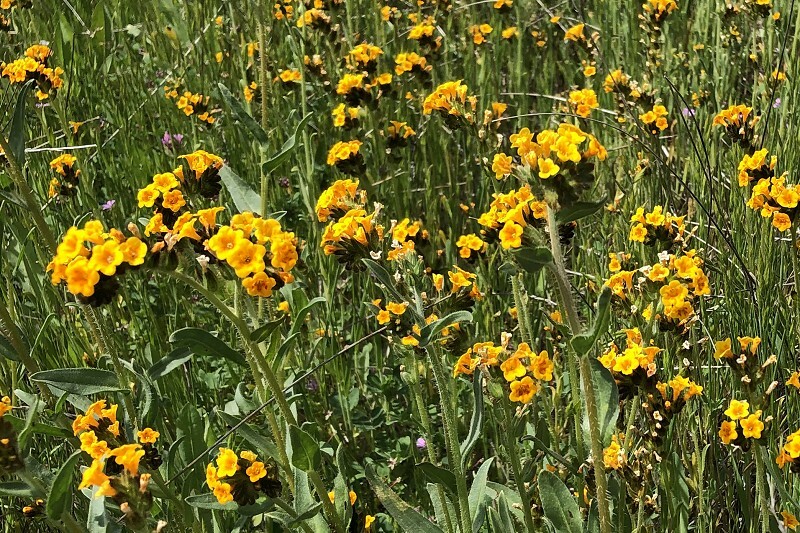 I found some in the trail. It fizzed very nicely in a drop of acid, as you’d expect. The shells were small and mostly fragmentary. Naturally I left it there, under the East Bay Regional Park District’s protection. 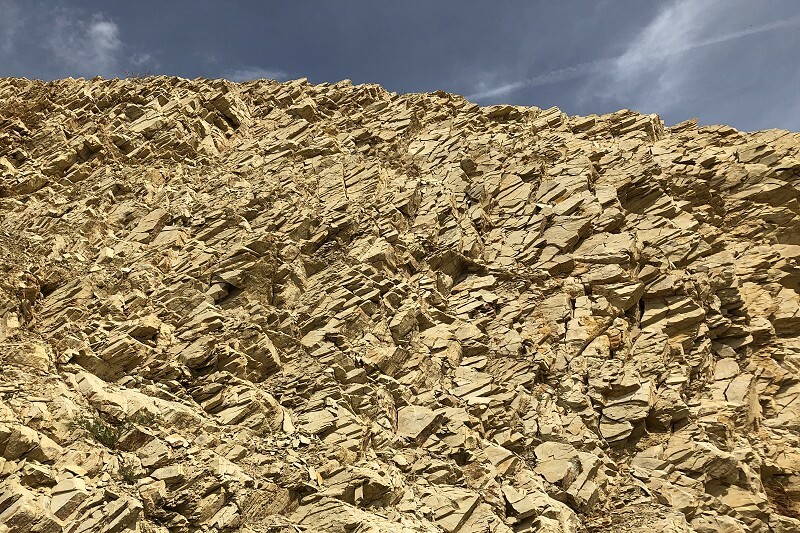 Dorothy Radbruch of the U.S. Geological Survey looked at this rock unit again in the late 1960s and called it “sandstone and shale,” primarily fine-grained sandstone. She noted that it was fairly strong, holding up 1:1 slopes, which is reassuring for homeowners in that part of the canyons. Most of what I saw in the roadway was siltstone — usually massive, or featureless, but occasionally laminated like this. 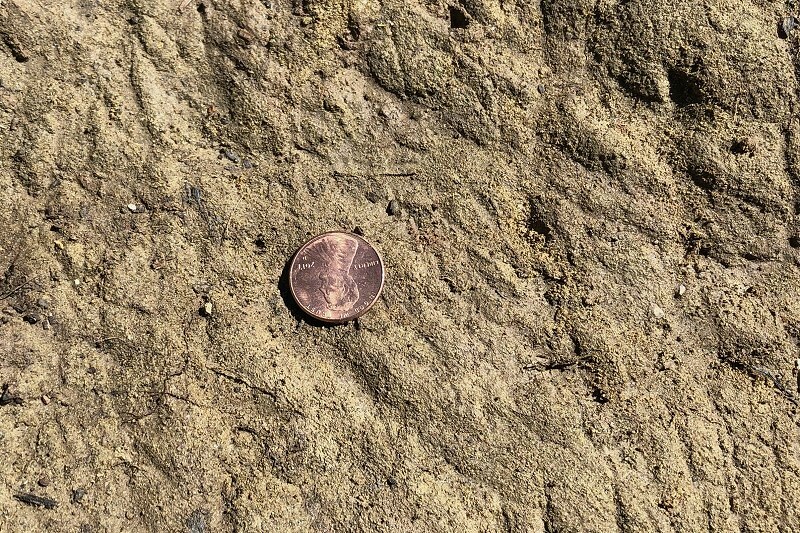 The USGS’s Russ Graymer, in the 1990s, characterized it more simply as green and maroon mudstone with occasional sandstone. 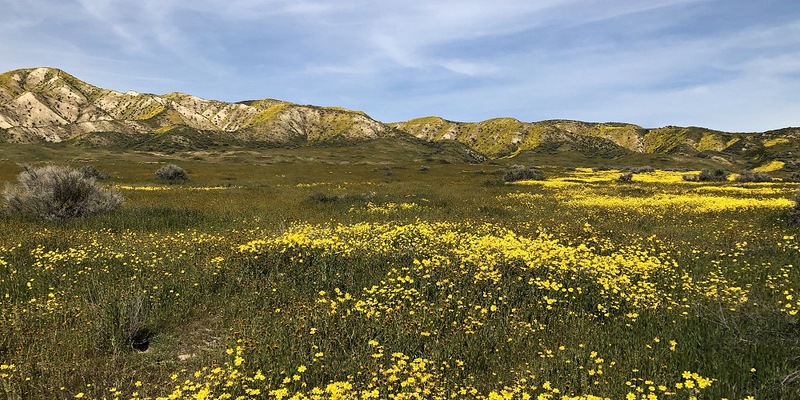 He stated confidently that it was faulted on the top and bottom — just another small card in the well-shuffled deck of Coast Range rocks in the greater San Andreas fault zone. In brief, it’s an isolated body of pretty clean mixed fine sediment that must have formed off the seacoast, not too near. 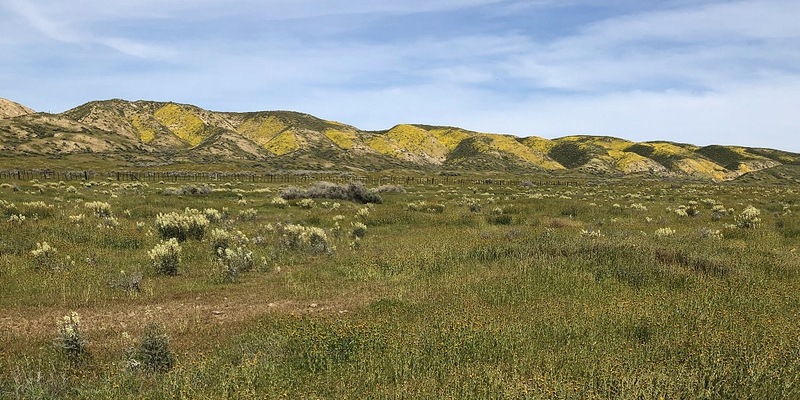 It got lost in the shuffle as California was sliced, diced and rearranged between the middle Eocene and now. 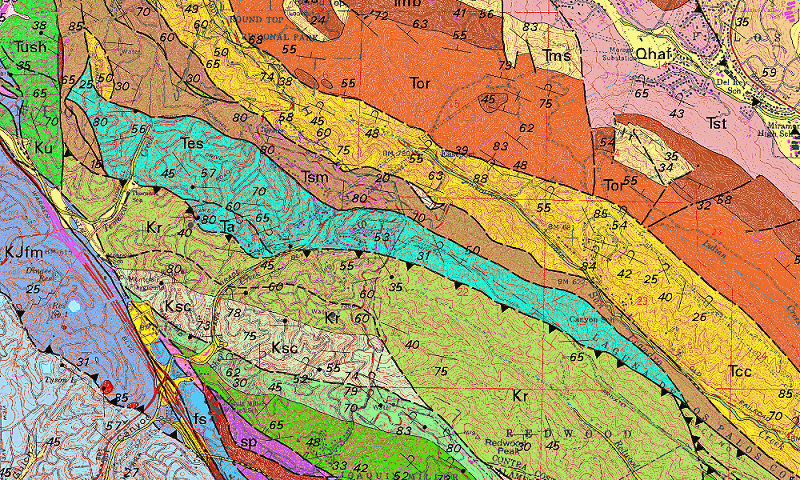 Here’s a detail of the geologic map, plus the equivalent area in Google Earth, in case you feel like poking around. 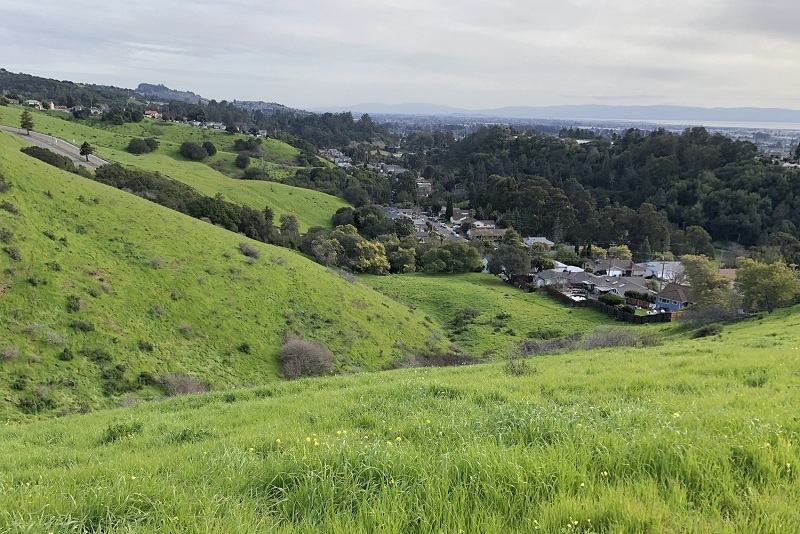 But note that just north of the East Ridge Trail, it’s East Bay MUD watershed land. Top to bottom: Tor, Orinda Formation; Tcc, Claremont chert; Tsm, Sobrante Formation; Tes; Kr, Redwood Canyon Formation. The line with the teeth is a thrust fault, south side up. The woods are rapidly closing in from their winter openness, and the slopes are in that brief interval between slippery-wet and crumbly-dry. 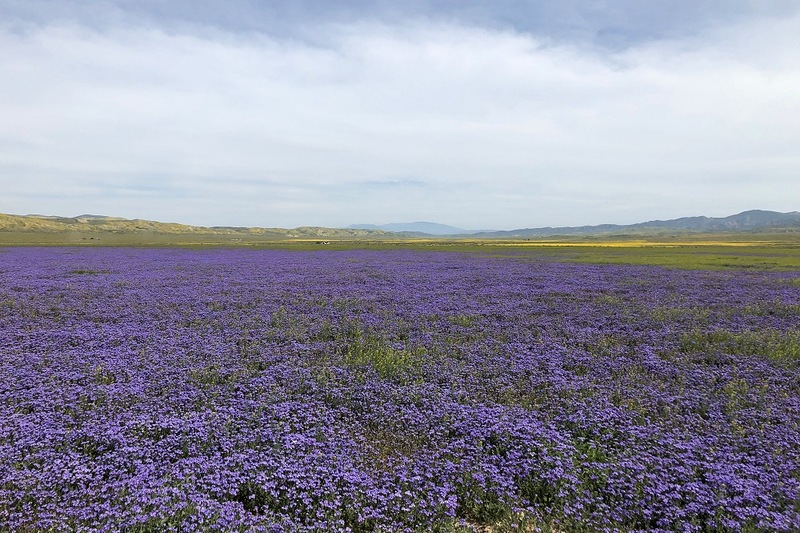 I’m itching to return while I can, and it’s not from the poison oak, yet. 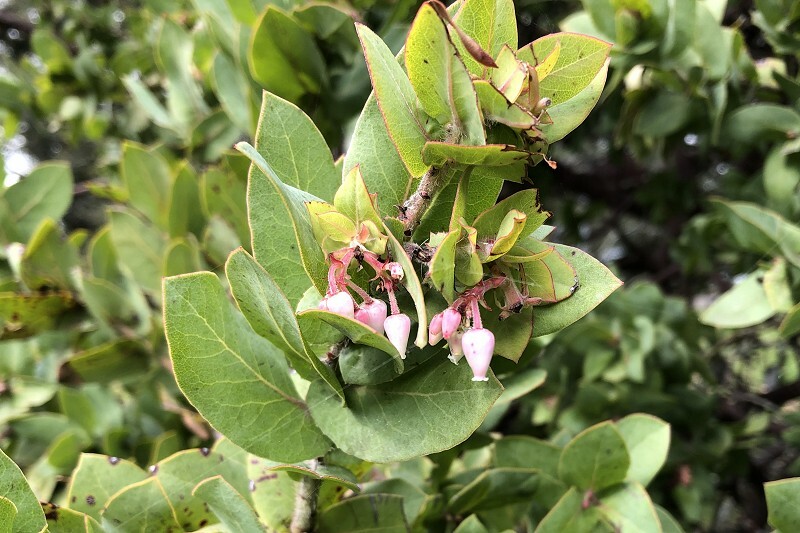 Already I’ve missed the manzanita blooming season, except for a rare straggler . . . I haven’t mentioned it lately, but I’m writing a book on the geology of Oakland. One chapter is about a road trip that takes you to nearly every different rock unit in town — actually it’s pretty much the one I posted in 2017. 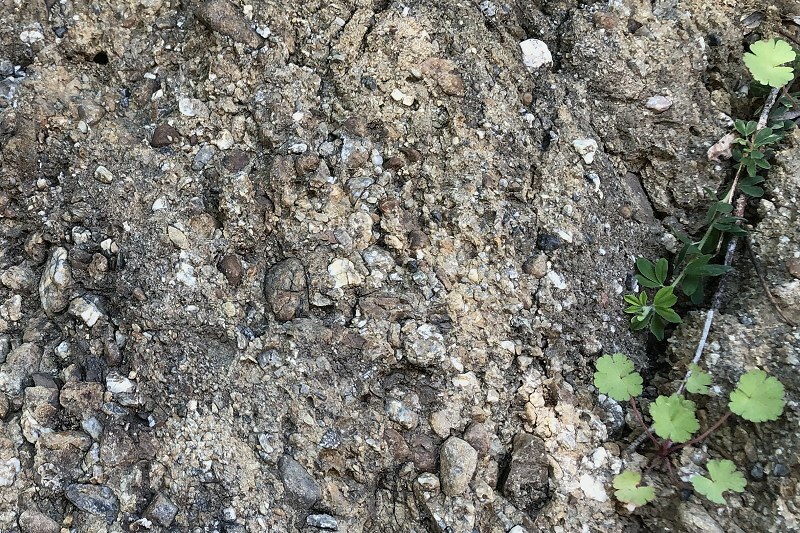 One problem with that posted route is that it doesn’t pass an exposure of the Orinda Formation with its beautiful conglomerate. 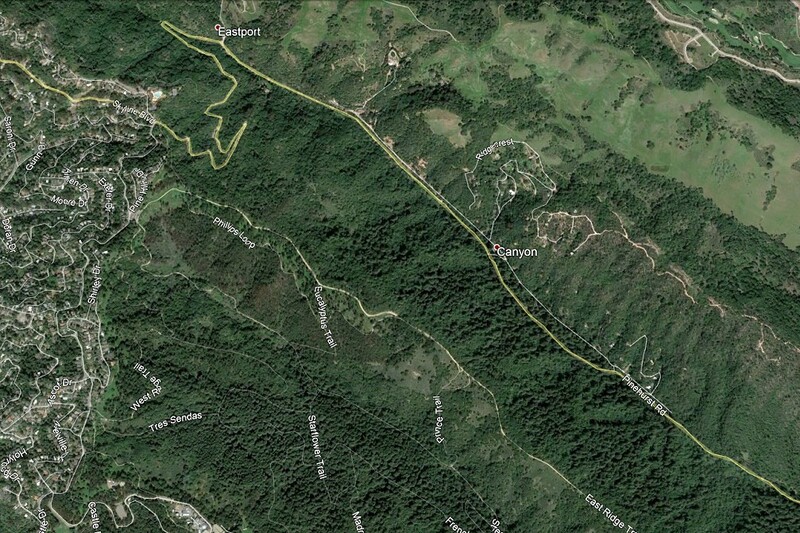 The Orinda underlies the four-way intersection at the top of Claremont Canyon, but you can’t see any of it there. The intersection is in a topographic saddle, and it’s a saddle because the rock erodes more easily than the lava flows and chert beds that flank it on either side. That’s right, conglomerate — that rugged-looking stone studded with cobbles and boulders — is crummy rock. So my road tour has to detour at this intersection, going down Claremont Boulevard a little ways to a spot where you can study the conglomerate at leisure. You’ll pass excellent exposures of it on the way, but there is literally no space to stand there. The closeup of that rock that I posted here back in 2008 (still a favorite shot) was acquired at some peril. 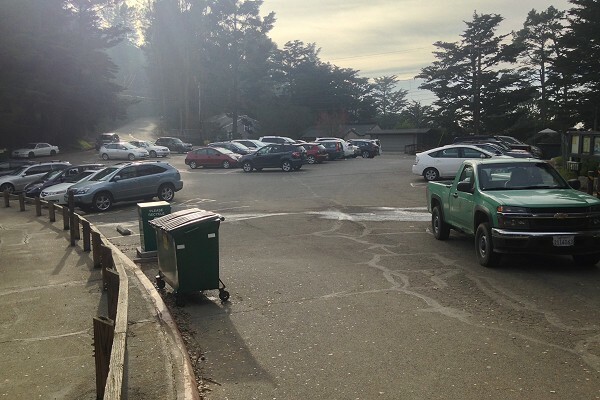 No, instead of stopping, you go around the hairpin turn and pull over at the entrance to UC Berkeley’s open space reserve. 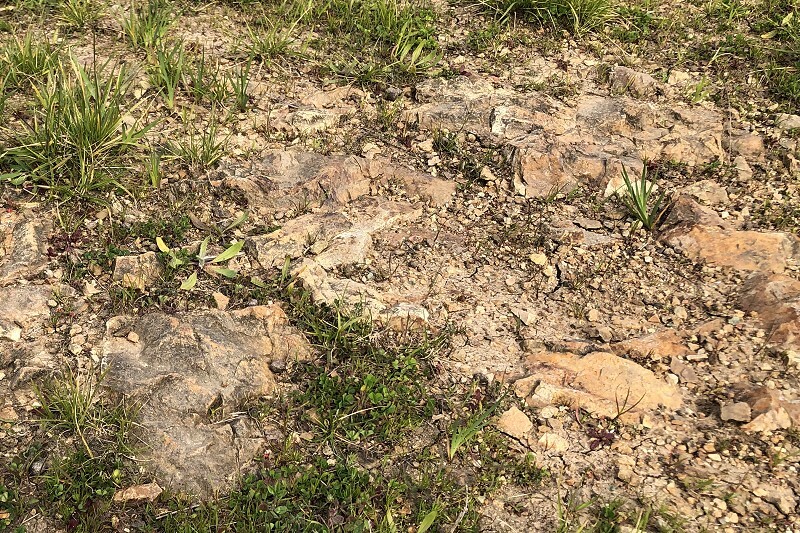 If you’ve followed along over the years, this is a familiar stop, the type locality of the Claremont Shale. 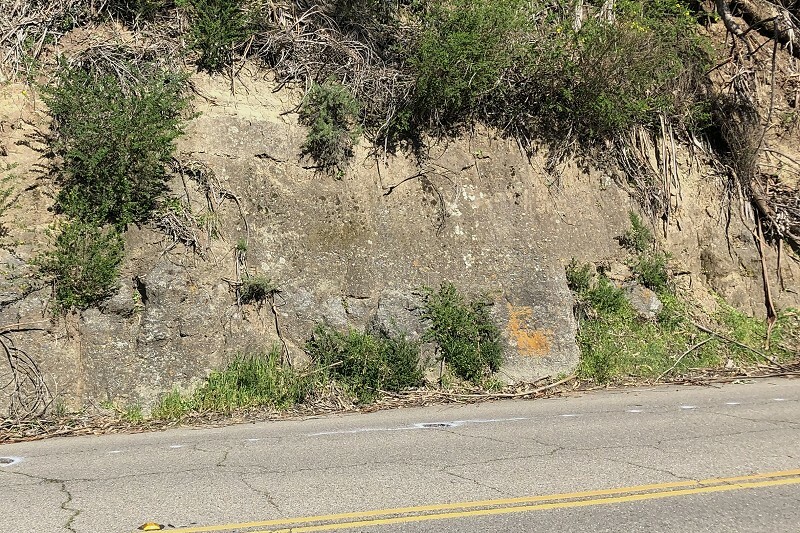 Just uphill from that classic spot, the chert beds give way to Orinda conglomerate. Look back across the road toward the head of Claremont Canyon, and that fire road (the Summit House Trail) is what you’ll take, just to where it enters the trees. 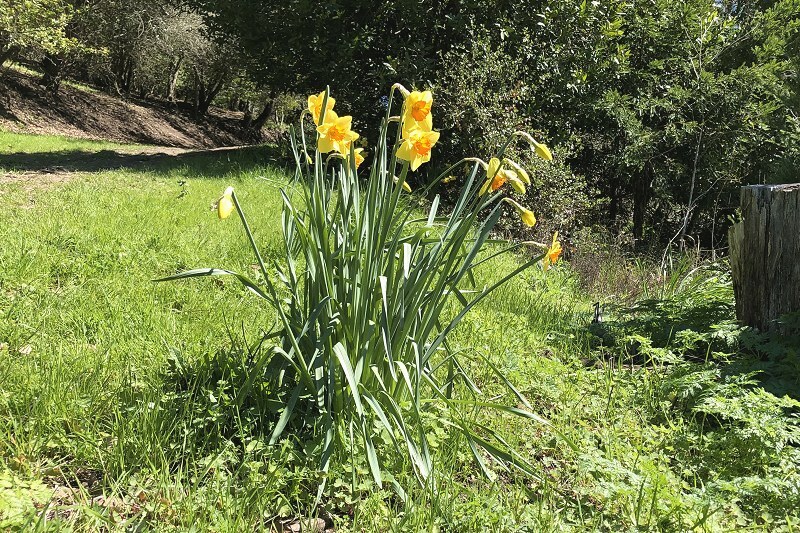 If you hurry, these daffodils will still be there to check your credentials and wave you through. The uphill slope is dotted with big clean boulders. Some are showoffs . . . But all are worth a close look. 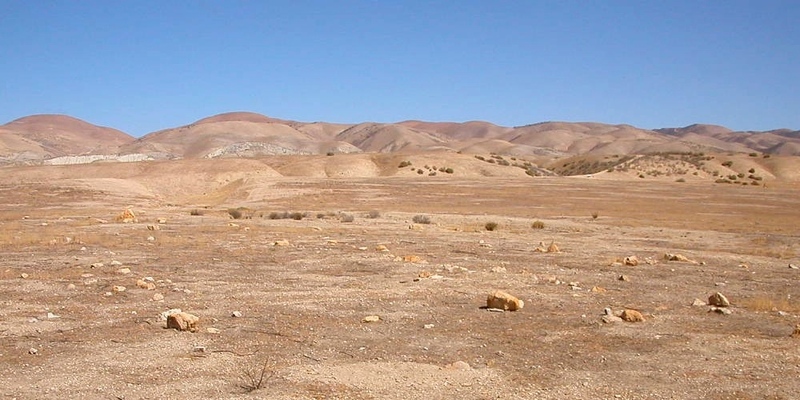 I ranged up the slope here, looking for proper outcrops of the conglomerate, but there are none to be found. It seems these boulders rolled down here the last time Claremont Boulevard was upgraded, and it’s pure serendipity they’re so nicely on display for you now. The nearest thing to an outcrop is a spot where the fire road scrapes down to bare rock. 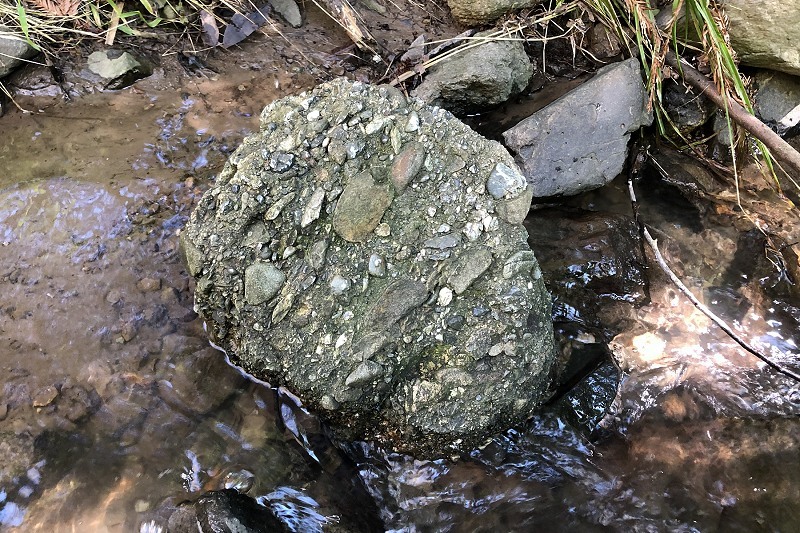 It’s a clean fine-to-medium sandstone, also part of the Orinda Formation. 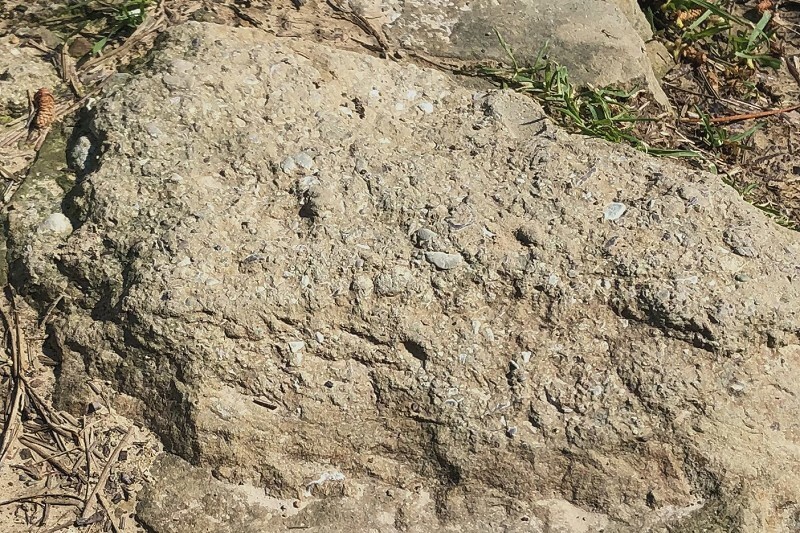 This finer-grained rock is where fossils are occasionally found, but I have to tell you I’ve never seen one myself. When the Caldecott tunnels were being bored through the hills, paleontologists were hired to collect fossils from the spoil piles. 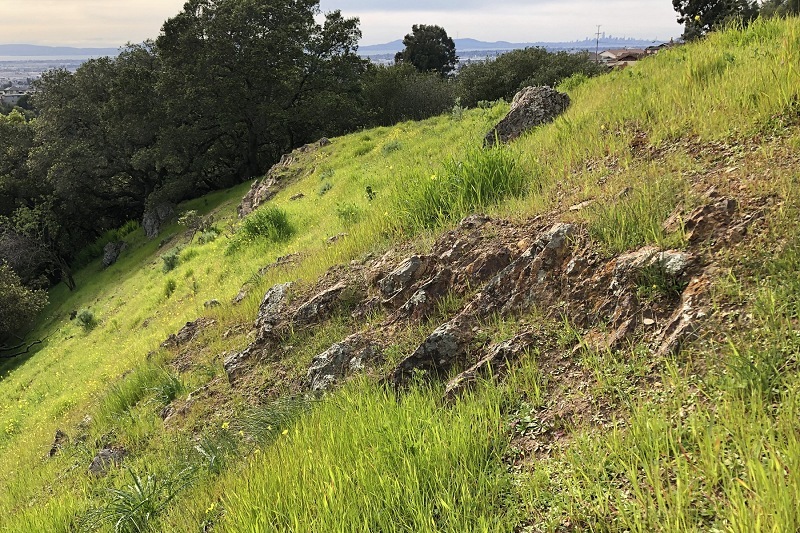 (See some of the Orinda Formation fossils here and here.) 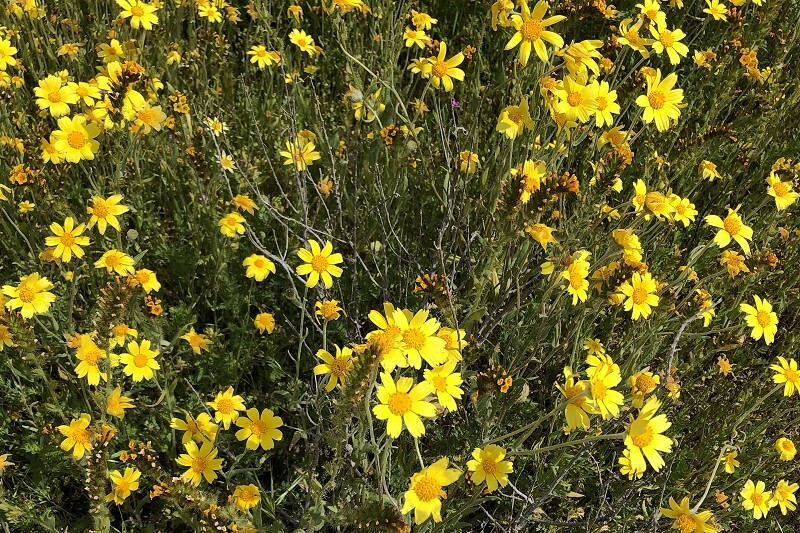 The fossils testify to a warm land of woods and year-round moisture, not much like today. These boulders look like they’ll be around for a while. Pay them a visit some time in the next few decades. But ultimately, rocks are perishable. Sooner or later they’ll make their way to the sea and be recycled in new rocks. 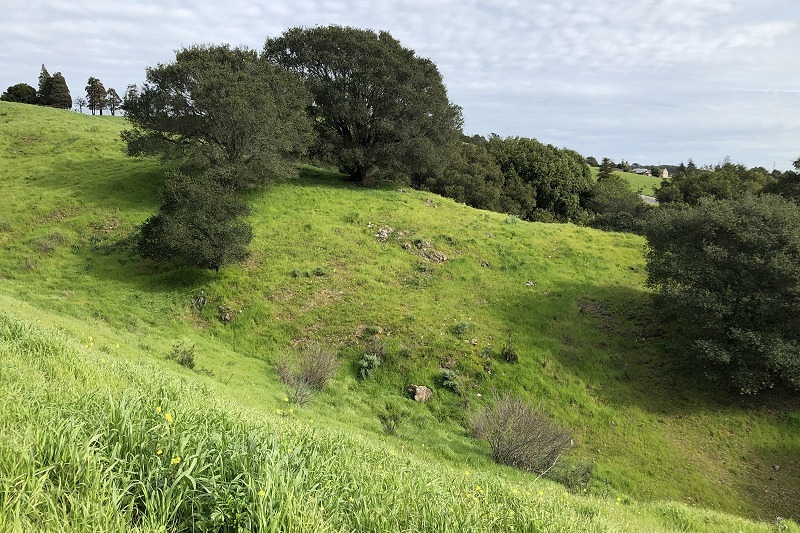 The cobbles preserved in the Orinda conglomerate are all that remain of a whole landscape of rocky uplands that once existed here in Miocene times, some 11 million years ago. Not even mountains last forever. 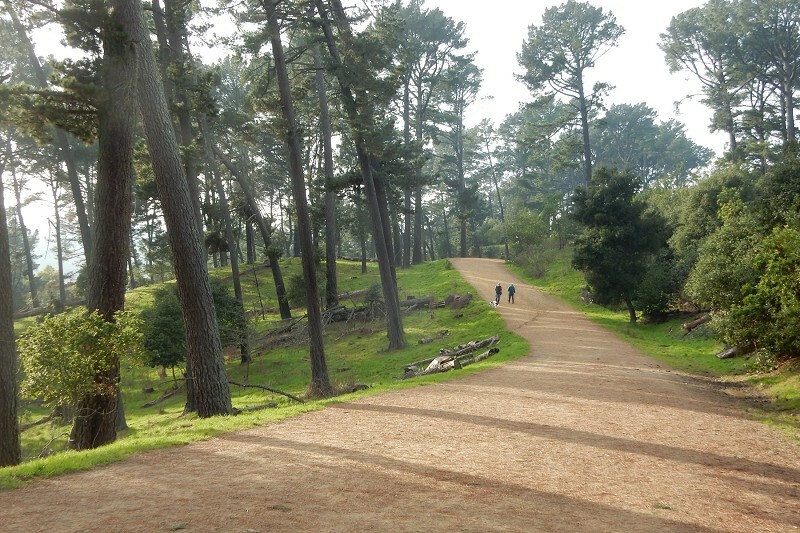 After tramping all over Oakland, I still find its landscape full of uncertainty and mystery. 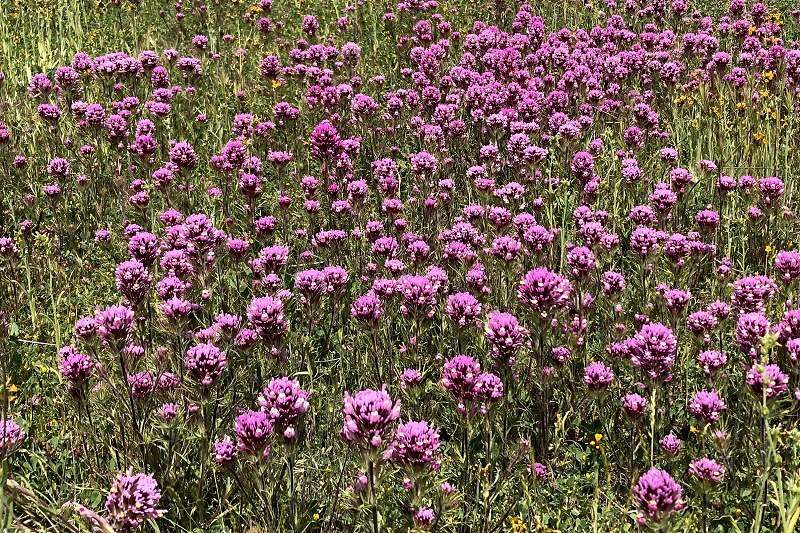 The alluring hills of King Estate Open Space Park have brought me here time and again, sometimes to lead walks, sometimes to just stop and smell the flowers. Last month I came back yet again, this time to look harder at it. 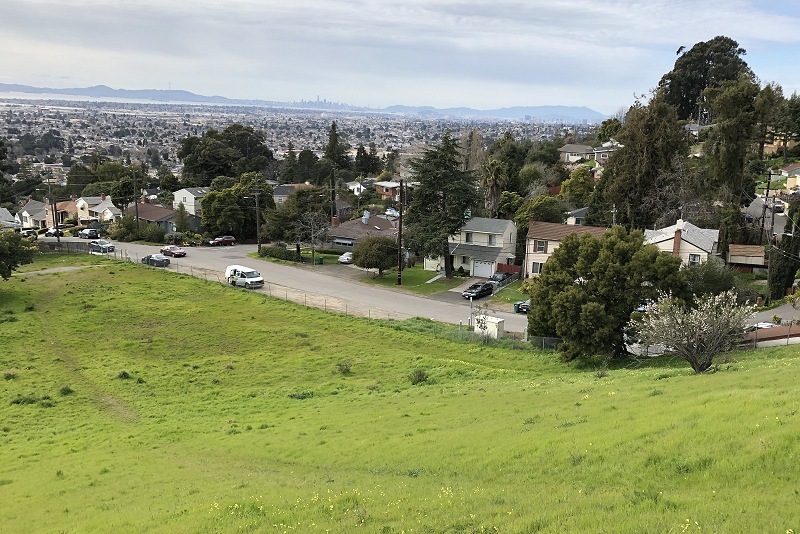 King Estate Park is a grassy ridge at the south end of the Millsmont-Eastmont hills, an apparent pressure ridge that stretches along the Hayward fault from Mills College to the Oakland Zoo area, between Seminary Creek and Arroyo Viejo. 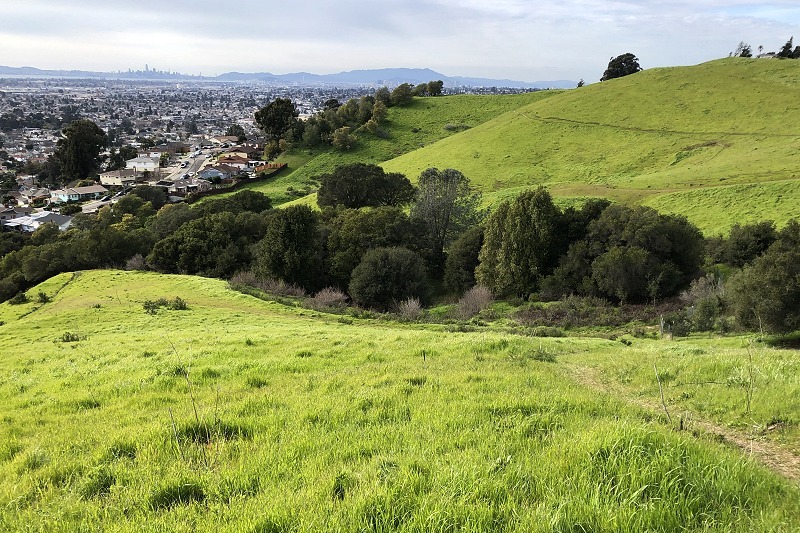 What drew me here as a geologist was the geologic map (USGS MF-2342) that depicts the area as a peculiar ancient gravel (Qpoaf on the map), the largest piece of this material in Oakland. 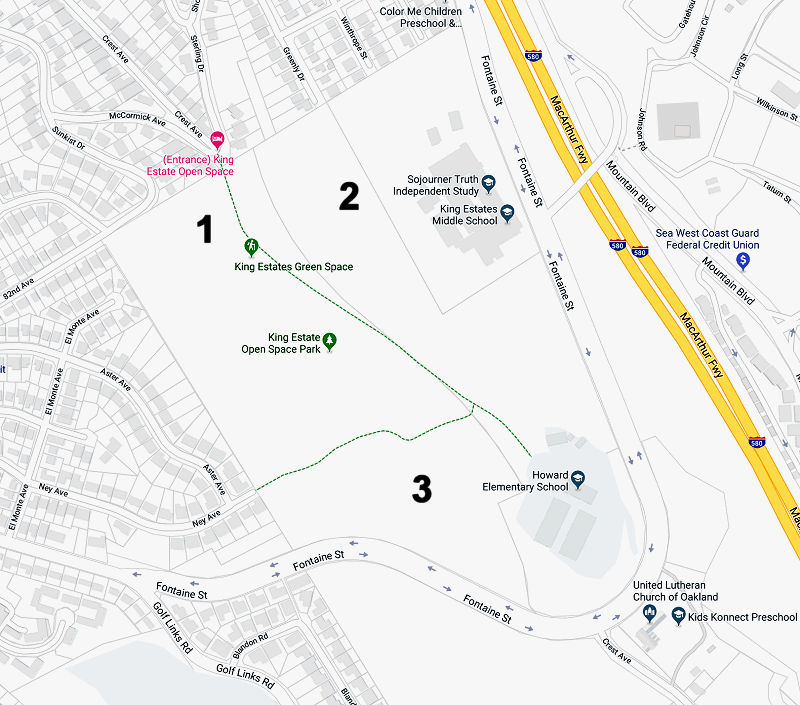 I explored the portion of the park north of Fontaine Street. Here’s the street map, marked with the three locations I’ll be showing photos of. 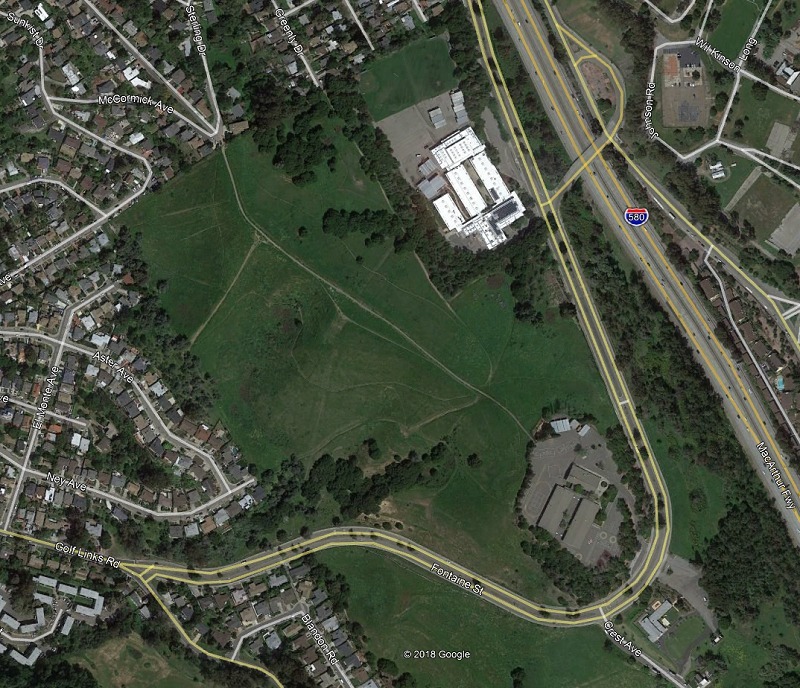 And here’s the aerial view, from Google Earth. 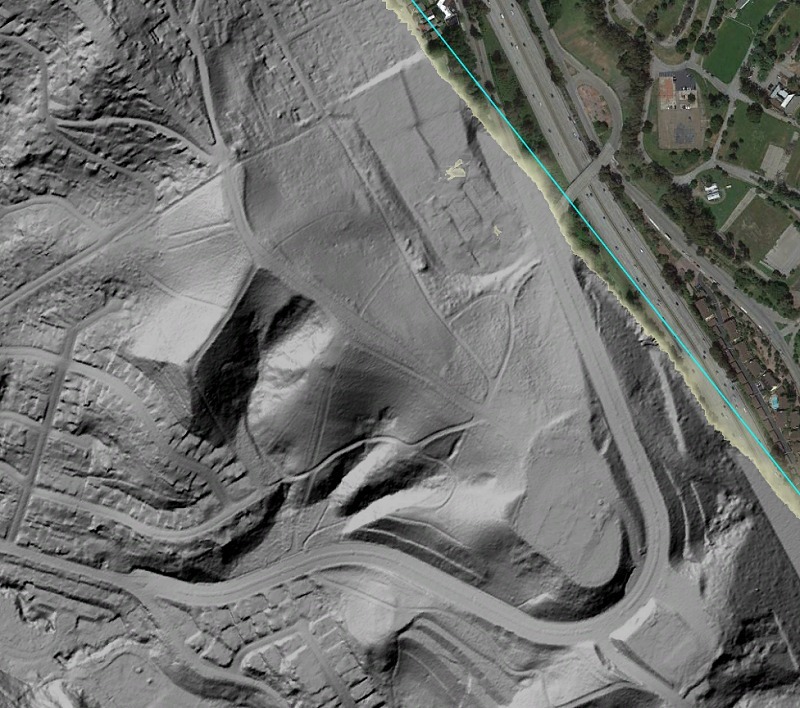 And just for fun, here’s the digital elevation model, with buildings and trees removed. OK! Location 1 is on the steep western slope at the north end of the park, which I climbed. 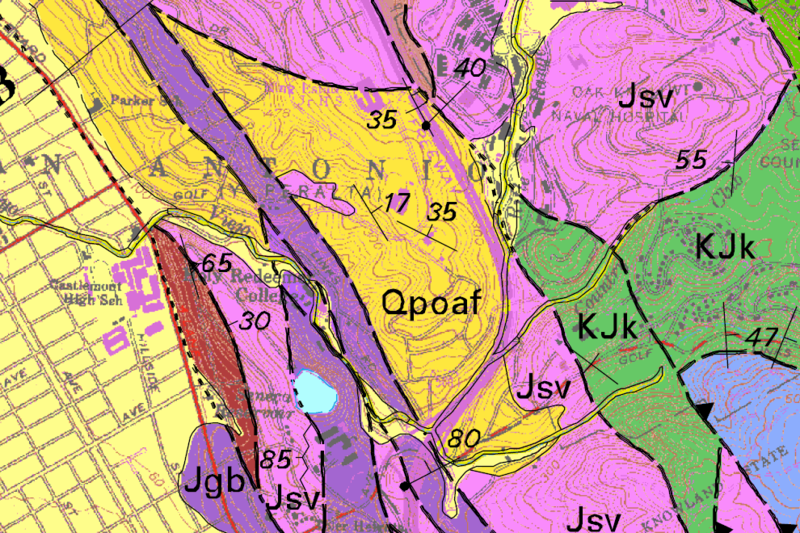 Halfway up is a sizable area of rock rubble consisting entirely of Leona volcanics, the same bedrock shown in pink labeled “Jsv” on the geologic map. The near-outcrop is in the lower left corner of this shot. And the rock looks like this. Down at location 2, there’s a spiral labyrinth that people have made in the last few years; I don’t remember seeing it before. But on the assumption that it’s made of stones from the immediate surroundings, I infer that it’s Leona volcanics over here too. 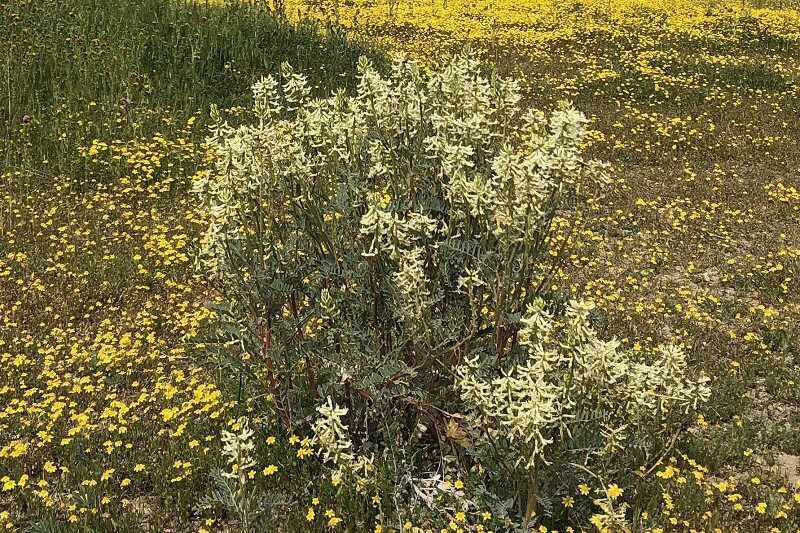 The Leona is generally light-colored with some greenish bits and some red-orange coatings where it’s weathered, hard to describe in detail but distinctive once you’re familiar with it. 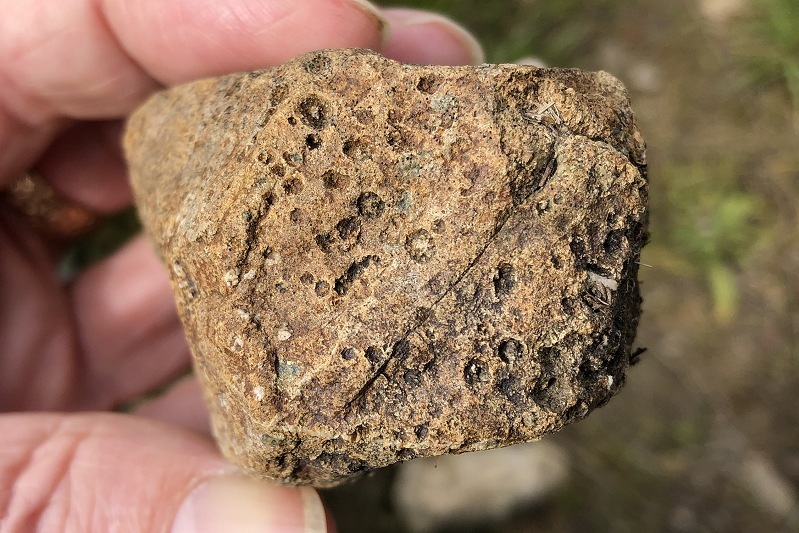 Once a range of underwater volcanoes that subsequently underwent a lot of alteration, it offers up a variety of intriguing bits that lacking a petrographic lab I can only scratch my head at. 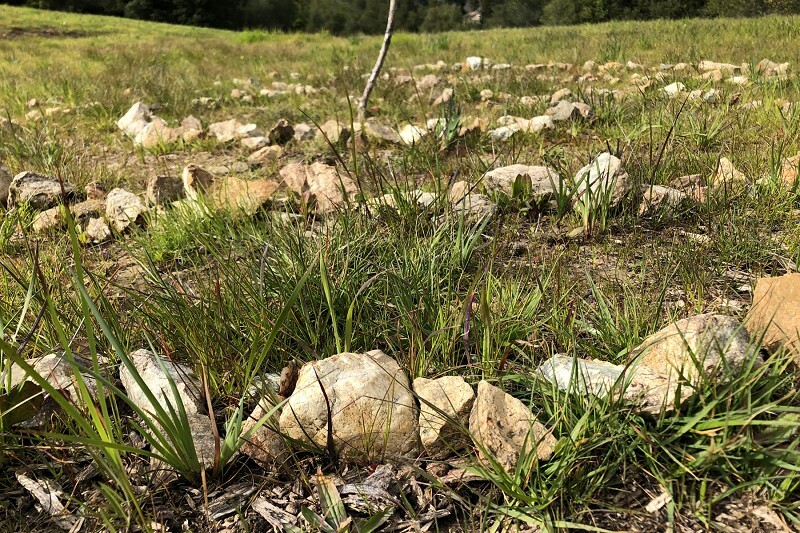 Anyway I’m looking all over, and every bit of gravel on this hill is Leona volcanics. Now a river gravel, which is what the map describes and what I expected (indeed, what I actually perceived on previous visits! 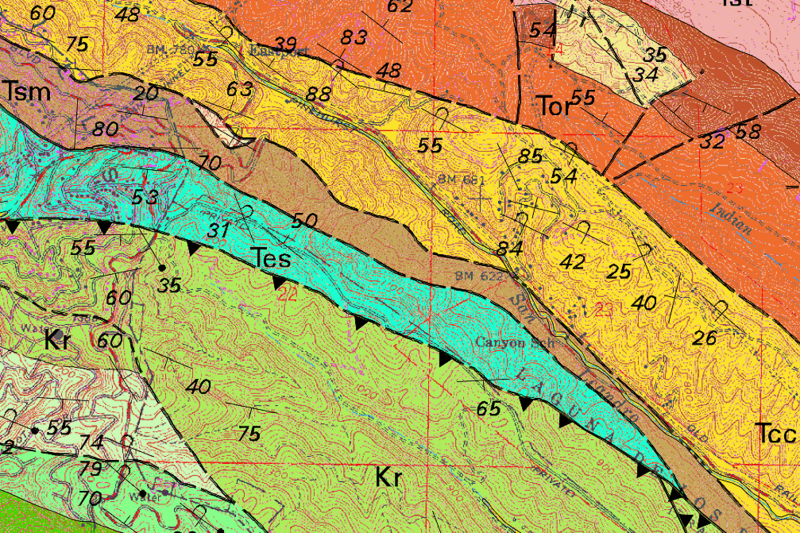 ), consists of rounded clasts and a variety of rock types from the stream’s catchment. Other gravels in this town are just that way, but not this. 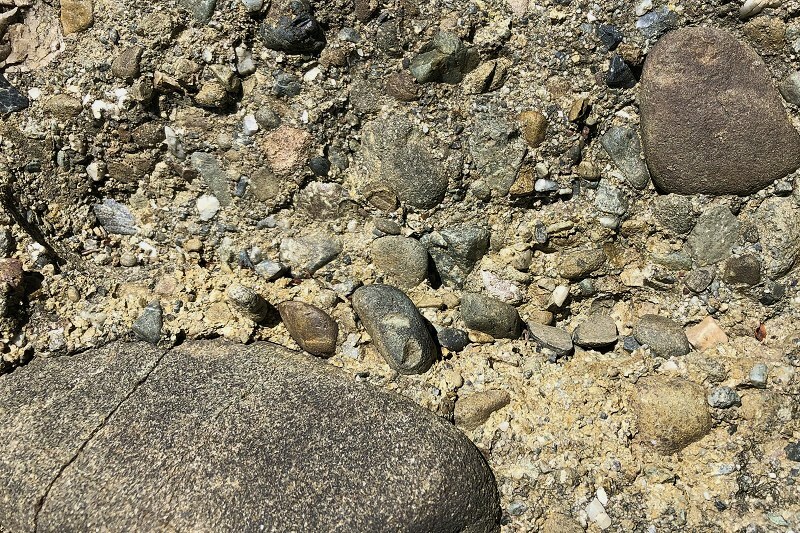 The whole time I’m there I’m muttering to myself, “this stuff is colluvium” — raw rock rubble, mixed with soil, that hasn’t moved from its birthplace except maybe in landslides. In location 3, we have proper bedrock. 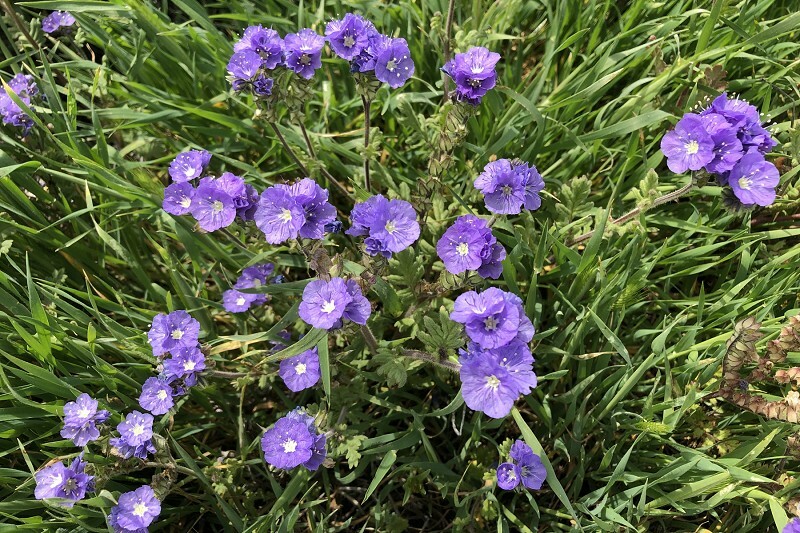 It show up where the soil has been scraped bare . . .
. . . and farther down the slope in genuine outcrops, which I always cherish. So in sum, the whole north half of the park, far as I can tell, is either bedrock or colluvium of the same stuff: Leona volcanics. How did it get to be mapped as Pleistocene river gravel? 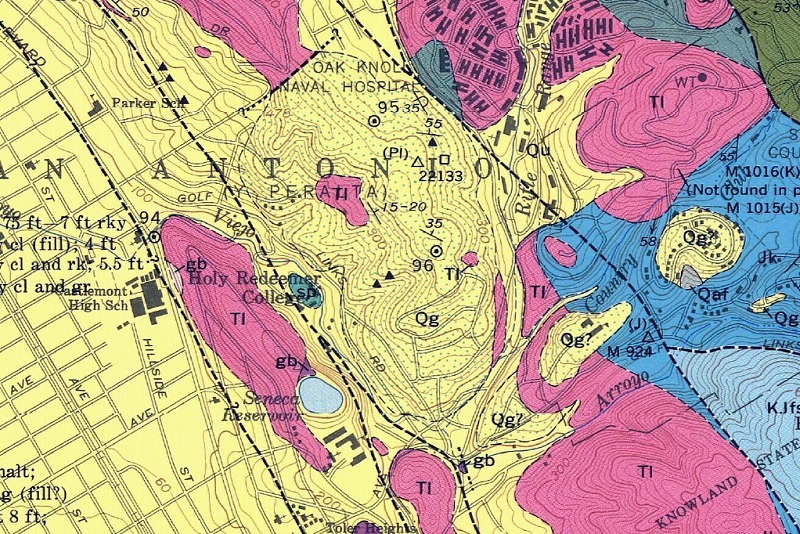 The MF-2342 geologic map was published in 2000. There are two previous serious maps of this area. Dorothy Radbruch mapped it in the 1960s for map GQ-769, and there the area looks like this. 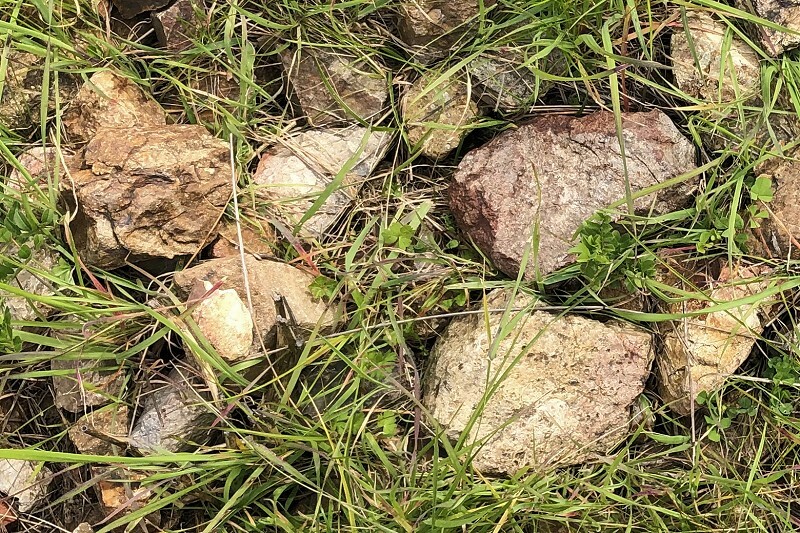 She called it “Qg”, “gravel, sand and clay” and noted that it contains pebbles of Leona Rhyolite (what I call Leona volcanics). She also said this: “Contains molluscs of probable early Pleistocene (Irvingtonian) age.” They were at the locality marked by the triangle with “22133” next to it; that number refers to a “report filed at Washington, D.C.” which is probably gathering dust deep in a back room. She also referred to reports on two boreholes, numbered 95 and 96 on the map, which recorded various kinds of gravel down as deep as 45 feet. That could’ve been deeply weathered Leona as easily as anything else. But you know what? 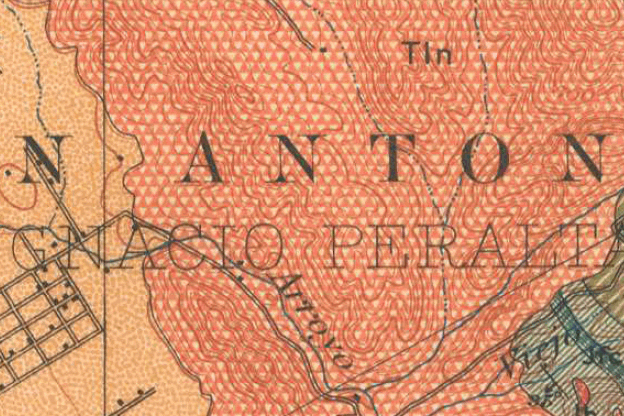 I’m going to go with Andrew Lawson’s original map of the area from 1914 (Folio 193), in which everything is just straight Leona. Even though he thought the Leona was very young (hence the name “Tln” meaning Tertiary Leona), he could tell what the ground was saying. At least, he and I agree. I’m sure, though, that he scratched his head as much as Dorothy Radbruch and I did. And they must have enjoyed the view as much as me. I’ll just have to poke around here some more.